Urho Kaleva Kekkonen (1900-1986), was the President of the Republic of Finland for 26 years between 1956-1982. Kekkonen was one of the most influential people in Finland’s recent past and his political and personal legacy are priceless beyond measure. Kekkonen is a synonym for post-war Finland, and it is largely due to his efforts that Finland managed to remain impartial during the Cold War. The height of Kekkonen’s political career came in 1975 with stage III of the Conference on Security and Co-operation in Europe (CSCE) held in Helsinki. In addition to President Kekkonen’s political legacy, Finns have been particularly interested in his personal image and in aspects of his personal life. The President’s residence, Tamminiemi has been a museum and the town of Orimattila houses the UKK-archives. Kekkonen’s outward appearance and dress style, with his large eyeglasses has been engraved into every Finn for multiple generations, with everyone having a mental image of the long-time President. Until now, very little attention has been given to the President’s wristwatches. Photographs and newsreel reveal, that the President always wore a watch – as was the custom of the time – but no archive or collection houses watches worn by Kekkonen. I managed to get some insider information on one watch, though; in the 70’s President Kekkonen owned an Omega Speedmaster, which he gifted to reporter Maarit Tyrkkö. Tyrkkö was Kekkonen’s most trusted journalist and close personal friend. Tyrkkö has written two books about her relationship with President Kekkonen: The Girl and the Tape Recorder (WSOY 2014) and The President and the Reporter (WSOY 2016) – in the latter, she briefly mentions the watch. In April 1978 Tyrkkö bought herself a watch at the airport, returning from a trip to the Caribbean. Upon meeting with the President after her return, Kekkonen noticed Tyrkkö’s new watch – one with clearly marked numbers on the face. 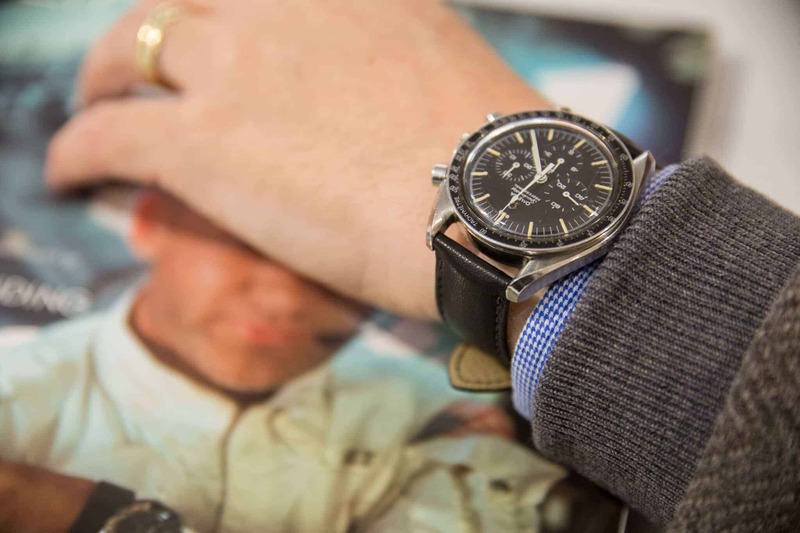 The Omega Speedmaster doesn’t have large numbers, and the then 78-year old President proposed a trade: Tyrkkö would get the Omega and he this new watch, one that showed the time more clearly. In Tyrkkö’s own words, the President made her an offer she couldn’t refuse. The Omega has since been in Tyrkkö’s possession, and has gotten into many an unusual situation; of which you can read more about in Tyrkkö’s books, provided you speak Finnish. Since Finland is celebrating 100 years of independence, this watch became of particular interest to me. I contacted Maarit Tyrkkö and she confirmed that she still owned the watch and was more than willing to show it off to me. We arranged to meet, and I asked her to bring the watch along. The atmosphere was Presidential to say the least, as the watch was brought forth from its storage pouch. What appeared was an Omega Speedmaster Professional, scratches, scuffs and all. The original metal bracelet has been lost to time, but apart from that, everything seemed original. A quick wristing left me speechless: I was wearing Finland’s President Urho Kaleva Kekkonen’s Omega Speedmaster! The watch has stayed in very good shape through the decades – though the patina on the watch face speaks of passed time. We had arranged a meeting with a watchmaker from Tampere for a closer inspection of the watch. Opening the back of the case gave us the exact reference number of the watch: ST 145.012-67, the same model as worn by NASA Astronaut Michael Collins on the Apollo 11 mission, the first mission to land on the Moon. The interior of the watch housed an amazingly well-preserved movement in caliber 321. The watch face is beautifully patinaed and the nearly mint condition bezel is marked with the coveted Dot-Over-90, a much desired hallmark of early Speedmasters. The same model was worn by NASA Astronauts on the lunar surface in July, 1969. Tyrkkö has never had the watch serviced, but the watchmaker observed that the watch had seen maintenance at some stage in its life. Thus, we can surmise that is must have been sometime in the 70’s. “An unbelievably fine timepiece” said the watchmaker. It’s easy to concur. A peak at Omega’s records reveal the exact history of the watch. The Extract from the Archives I ordered from Omega reveals that the watch was completed at the factory in September 1968 and shipped on to a Swiss retailer. I have attempted to ascertain from multiple sources how the watch ended up in the hands of the President, but no-one seems to have that information. Taking into account the information from the archives, we can assume that the watch was either brought to him from abroad or he has bought or been given the watch while abroad himself. The President visited Switzerland on a state visit in 1973, and the watch could have been procured then. It’s also quite possible, that Kekkonen visited Switzerland on other occasions as well. As President Kekkonen hosted the CSCE Conference in Helsinki, the eyes of the whole world turned to Finland for a few days. Attending were US President, Gerald Ford, Soviet Premier Leonid Brezhnev and Yugoslavian President Josep tito. According to Maarit Tyrkkö, President Kekkonen wore the Speedmaster during the conference, which is corroborated by press photos and newsreel footage from YLE’s Living Archive. Thus, the watch has been in the tumult of Superpower politics during the Cold War, keeping the host of the conference on schedule. His contemporaries remember Kekkonen as being exactingly punctual. Tamminiemi House’s long-time butler Pekka Vilpas has stated that dining times were usually exact to the second. Lunch and dinner were served daily at 12 noon and 6 p.m. (save for days when exceptional matters prevented this) – not five to nor five past, but exactly on the hour. As the President entered the dining room, it was the butler’s duty to turn on the radio, which sounded the 12:00 time signal at that very moment. Lunch was always accompanied by the daily noontime aphorism and news broadcast. Additionally, the President’s former security staff and adjutants have told, that during the various visits to companies, exhibitions and whatnot, it was of paramount importance to the President that the attendees would not have to be kept waiting on his account, but also that he not arrive too early and disrupt the event coordinator unduly. Kekkonen was known to sometimes peek at his watch repeatedly, if he felt the journey was taking too long. And sometimes his entourage would stop short of the destination for a while, if there was a risk of arriving too early. Then again, the President was never kept waiting, but it was down to the adjutants to schedule the journey times (when traveling in Finland) so that the President would always arrive last. Maarit Tyrkkö recalls that the President used his Speedmaster to time the March of the Björneborgers and Sibelius’s Andante Festivo on multiple occasions and compare the results. The Chronograph is the perfect tool for such activities. President Urho Kekkonen’s Omega Speedmaster Professional is a piece of Finnish watch history. At the same time it is a part of Finnish history as a whole, after all, it was worn by the Finnish Statesmane during times when Finland’s future was built and when the whole world was watching the Superpowers meet in Helsinki. We can state, with good reason, that the watch is literally priceless and that it is particularly great, that the watch has survived through the decades in the gentle care of Maarit Tyrkkö. For her it was a gift from a close and important person, for the rest of us it is a concrete reminder of our former President. The Omega Speedmaster Prodessional is an iconic watch, probably one of the most well known timepieces of all time. The watch has been in production since 1957 and it remains in Omega’s range to this day. During these 60 years, it has changed only in minute details. You can pick up your own Speasmaster – The Kekkonen Omega – from an authorised Omega dealer. The recommended retail price is 4400 euro. With this story, Stylefellow wishes all our readers a happy Finnish Independence Day, and congratulates Finland on 100 years of independence.